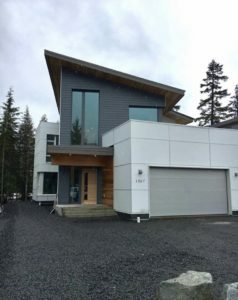 Situated in Cheakamus Crossing, the 2010 Olympic Athlete’s Village area, this building will be home to a young and active family, accommodating their outdoor orientated lifestyle. A 140m2 PV array located on the roof allows this project to be certified under the ‘Passive House Plus’ standard. The site -built wall assembly consists of a 2×6 frame with an exterior 9″ TJI cavity filled with dens-pack cellulose, Euroline’s PH window system covers the glazed areas and a Novus HRV will ventilate the main dwelling as well as the 1 Bedroom suite. The main challenge in the planning phase has been to achieve the ‘Passive House Plus’ classification, not a simple feat for a project this size.